The five star hotels in Munnar are cocoons of comfort, and provide perfect accommodation options for business travelers as well as holidaymakers. The hotels in Munnar rank among the best hotels in Kerala. Munnar, a small hill station nestled at the Kannan Devan hills, is also known as the Kashmir of South India. Perched at a height of 1600 meters above sea level, Munnar lies at the confluence of three mountain streams of Mudrapuzha, Nallathani and Kundala. Munnar is well-known for its lush green landscape, serene lakes, huge reservoirs, dense forests, spice gardens, and tea estates. Popularly known as the tea town of Kerala, it has some of the highest tea estates in the world. Besides, Munnar is an ideal destination for paragliding. There are a number of tourist destinations in Munnar that are worth a visit on your tour to Kerala. You can visit the towering Anaimudi Peak, the amazing waterfalls at Nyayamakad, the Echo Point, Rajamala, the unique Tea Museum, the famous Eravikulam National Park, or sail down the Madupatty Dam while in Munnar. Enjoy a memorable trip to Munnar in Kerala by staying at the hotels in Munnar. The five star hotels in Munnar offer you excellent and comfortable accommodation, dining, business and recreational amenities. You can choose from an extensive choice of Five Star Hotels in Munnar, offering a fantastic blend of tradition and modernity. Explore the various tourist destinations in Munnar staying at the five star hotels in Munnar, Kerala. India Hotel and Resort can help you book your room at any of the Five Star Hotels in Munnar. 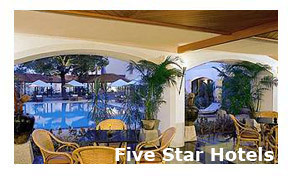 Find all you want to know about the Five Star Hotels in Munnar Kerala and our customized hotel packages. Indiahotelandresort.com offers online information and booking for Five Star Hotels in Munnar Kerala India.